Hot Cross Buns with added dark chocolate pieces, dried cherries, and/or raisins. Traditionally eaten on Good Friday before Easter, these spiced sweet rolls will be a holiday hit. Hot cross buns ALMOST ended up permanently on my Failed list. Logically, I don’t know how I messed it up the first time. 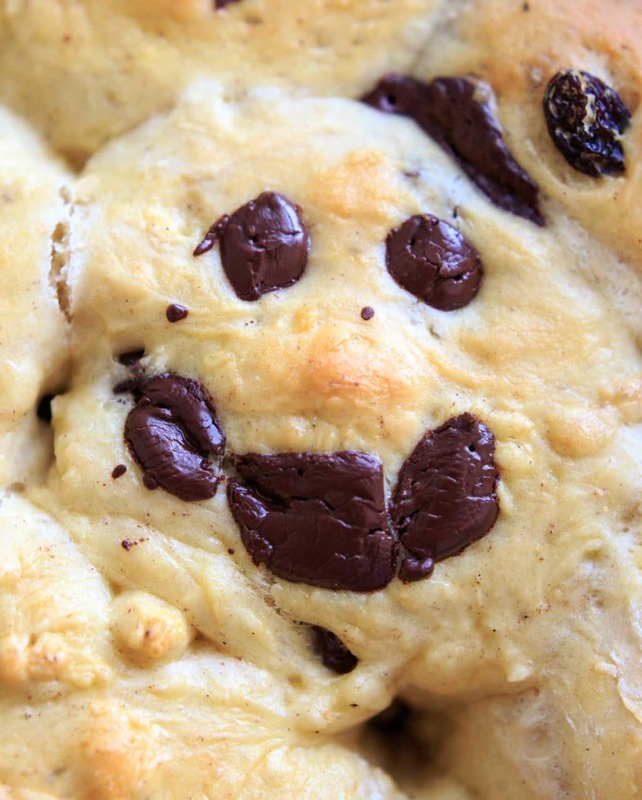 No matter what, you’d think you’ll still end up with deliciously sweet bread, right? There are about a million recipes online for hot cross buns and I tried to combine a bunch of them. Leave it to me to go off-script and ruin something as timeless as hot cross buns. Somehow mine ended up hard and tasteless. I tried to add the yeast directly to the milk instead of proofing it in water first (never works for me), not enough spices, and who knows what else. But never fear, I did not abandon the project! Since I’ve already given you both my Nana’s Easter recipes (here and here), I wanted to add to the list this year. What makes a hot cross bun a hot cross bun? Basically it’s spiced (with cinnamon and possibly nutmeg), with added dried fruit (usually raisins or currants) and a cross usually made out of either icing or pie crust. I wanted to make mine a little bit different so I decided to add dark chocolate pieces and use cherries instead. I also made a batch with a mixture of dried cherries and raisins together (mostly because I was running out of cherries), so go with whatever proportion you feel like. Since my first batch was such a fail, I figured I couldn’t go wrong starting with a tried and true recipe and adapting from there. I started with that recipe (minus some of the butter and added egg yolks), added spices and sweetness. And orange juice! That’s my secret ingredient in some recipes that need a hint more sweetness, and I figured it would work here since I’ve seen some recipes that use orange rind. The second picture above has an egg glaze with some grated nutmeg on top. You can either mix in the chocolate pieces or press some into the top of the dough before baking. My crosses might need some work. ALSO I learned that there is a thing called “not cross buns.” I wanted to call this post “not hot cross buns” but then all I could think of was that dumb game “hot or not hot.” Isn’t that similar to how Facebook started? Anyway, to get back on track, a NOT cross bun is just one that doesn’t have a cross on top. 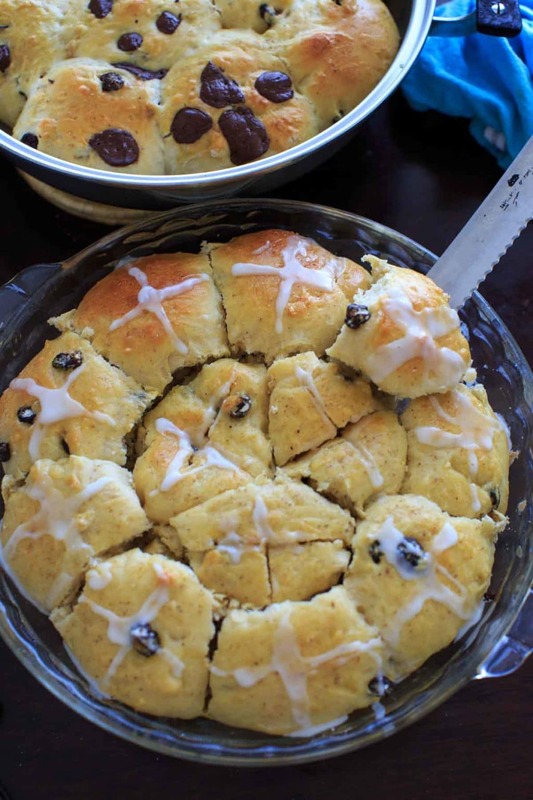 They originated because people started to get mad (/cross) when hot cross buns were sold before Good Friday (since that is when they are traditionally eaten in some countries or religions). To I guess make people happier (/not cross), some bakeries started putting something other than a cross as decoration. All of my decorating needs some work. I get it. Do you have any Good Friday or Easter traditions? If you make this recipe, tag it on Instagram with #trialandeater and @trialandeater, I’d love to see! In a medium pot, heat the milk, sugar, orange juice, butter and salt on the stovetop over medium heat. Stir occasionally and remove from heat once butter has melted (about 5 minutes). Do not let boil. Meanwhile, prepare the yeast by mixing it with the hot water. Let sit for 5 minutes until bubbly. Add the yeast mixture and 2 cups flour to a large mixing bowl. When combined, add in milk mixture, eggs, remaining flour and cinnamon. Knead with a dough hook or by hand for 5-10 minutes until smooth and elastic. 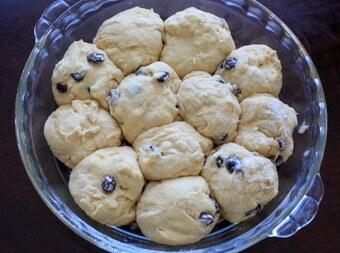 Add in dried cherries and chocolate pieces while kneading. Let rise in bowl for 1 hour. Separate into 24 rolls and place on greased baking sheets or pie pans. Let rise for another 30 minutes to an hour. Glaze tops of buns with a beaten egg and sprinkle freshly grated nutmeg if using. Preheat oven to 350°F. Bake for 22-27 minutes or until lightly browned. Prepare icing by combining powdered sugar and milk in small bowl. Once buns have slightly cooled, add icing in the shape of a cross (or any other desired shape to make "not cross buns!"). 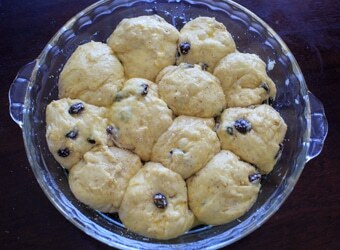 Recipe modified using this Easter Paska bread recipe as a base. Need more Easter recipe ideas? Check out this list of 40+ vegetarian Easter mains, sides, and desserts. It’s not ruined if it’s still tasty 🙂 Love the idea of chocolate in there – I know my son would be a fan – and I love dried cherries. 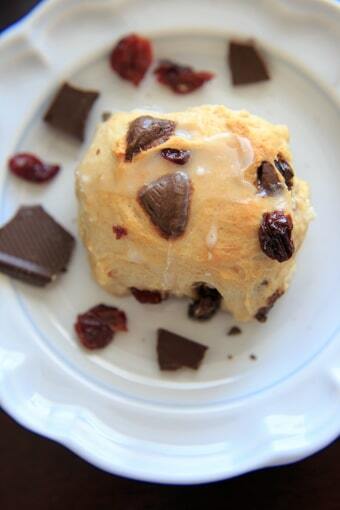 Adding dark chocolate is a great idea, I have had this buns for Easter but only have dried fruits. I bet the dark chocolate provides a very nice flavor. I love all the dark chocolate nibs peeking out. I’ll bet that just really makes these rolls shine. I’ve never had hot cross buns, but these look yummy. What a delightful sweet treat for easter! I love hot cross buns but with dark chocolate, even better!! This bread looks totally scrumptious! I am so happy when it is Hot Cross Bun season. I have never made my own. I like to stock up with the ones I find at the grocery store…and eat them for an extended time. I love the addition of cherries and chocolate. This will be on my “to make” list. Now I can enjoy them year round!! All these hot cross bun recipes and I’ve yet to try them before but I know that I would love these with the dark chocolate and cherry. Such a classic and delicious combination! I really need to finally try them out! 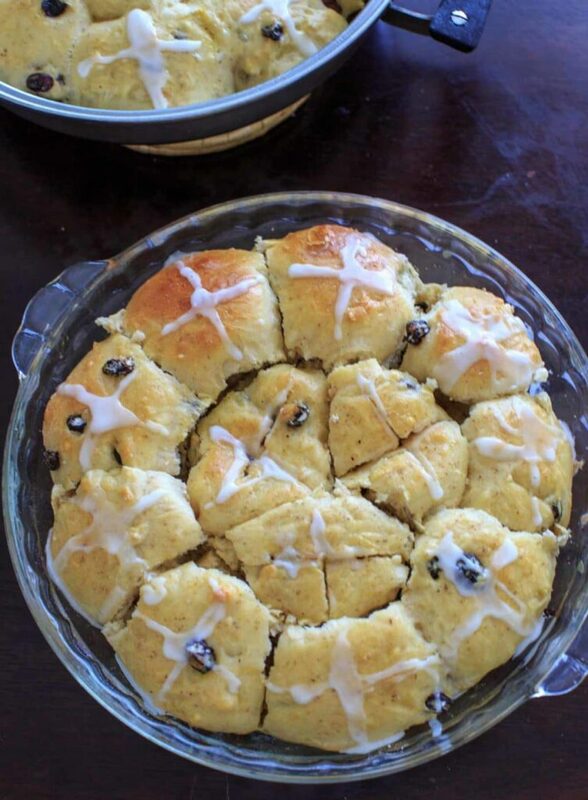 I’ve been seeing lots and lots of recipes for hot cross buns but I’ve never actually made them. Yours look lovely and I like the addition of chocolate in them..Yum! 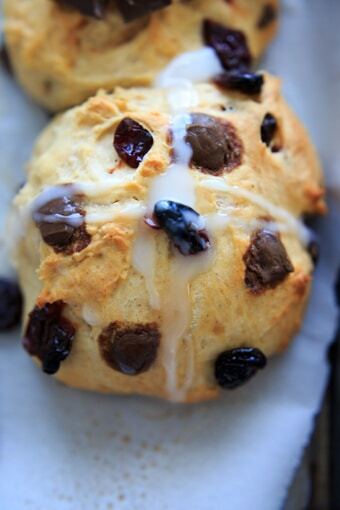 I am such a huge fan of cherries these buns look so good! And I have never heard the story about “not” cross buns, so funny how different food traditions get started! i am chocolate Lover So Can’t ignore this. I am definitely going to make this as soon as possible.thank you for sharing this. 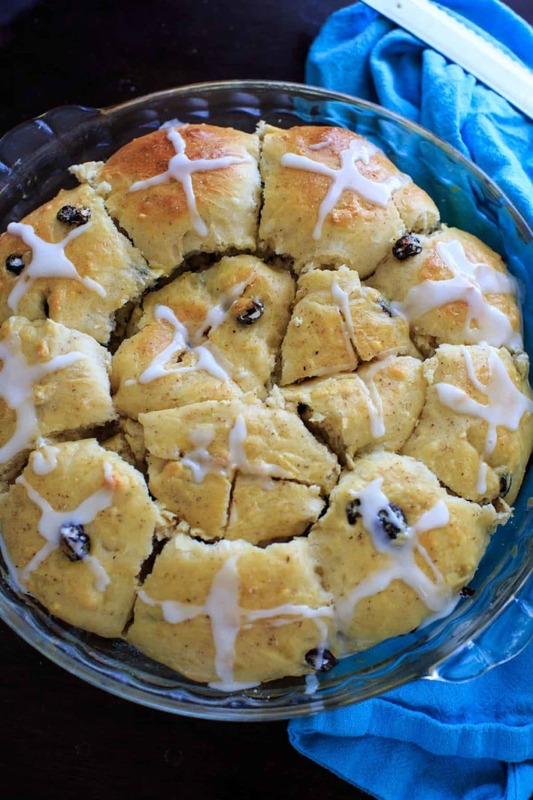 I have to admit that I have my eyes set on your Nana’s Easter bread ever since you first posted them and have them bookmarked to try soon. The Hot cross buns with the dark chocolate looks marvelous and what a treat it is for people who are not a big fan of the traditional buns. Thanks Sandhya, that Easter bread is one of my absolute favorites so I hope you enjoy it! As if Hot Cross Buns couldn’t get any better! Here you go and add dark chocolate to them – genius! These look and sound absolutely delicious. Forget Easter dinner – just give me these and a very hot coffee. Game on! Great additions into this classic dish! I love taking delicious classics and adding my own twist, these look great! 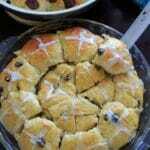 I love Hot Cross Buns – they are my favorite part of the holiday! Reminds me of my childhood, my mother and grandmother and I in the kitchen, shaping these and then munching on them for days. These look fabulous! The smiley face makes me laugh! Thanks Natalie! I have never had hot cross buns but now I most definitely need to try them! Love the idea of cherries and chocolate! Easter or not, hot cross buns are my favourite. In fact, in the UK they are available in supermarkets throughout the year, and they go down a treat with some butter on them. I love the addition of dark chocolate, it sounds great!